There is nothing very special about the Karni Mata temple from the outside. 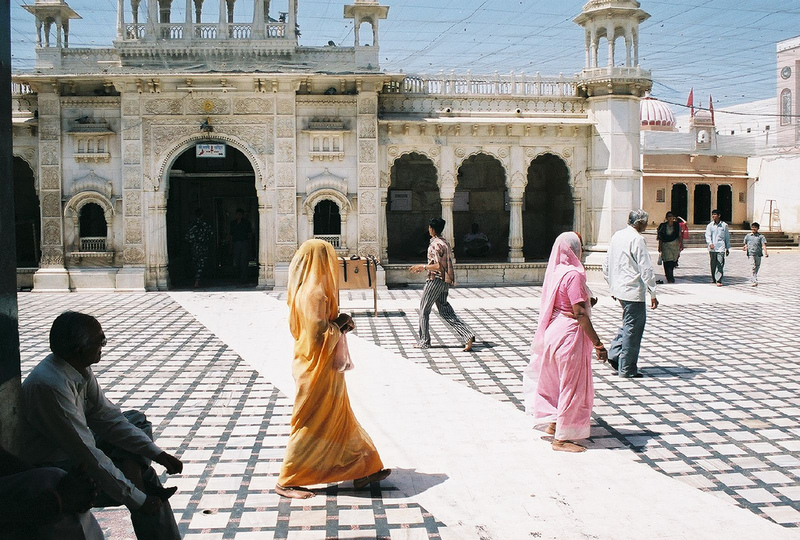 The thousands of pilgrims who stream into the sand-swirling desert town of Deshnok, in northern Rajasthan, don’t come here for the silver gates or white marble tile. Those embellishments are standard issue for Hindu temples in this part of India. No, they flock here for what’s inside. Rats. Twenty thousand of them to be more or less precise. Rodents fill the inner sanctum of Karni Mata, and it is the promise of an intimate encounter with these holy minions that draws in masses of tiptoeing pilgrims. According to tradition, Karni Mata was a 14th-century incarnation of the deity Durga, the goddess of power and victory. When the son of her favorite storyteller died, she implored Yama, the god of death, to restore his life. Yama refused, and in desperation, Karni Mata reincarnated the boy herself, in the form of a rat, under her care. Then, as payment for Yama’s obstinacy, she decreed that all storytellers would, henceforth, be reincarnated as rats, thus depriving Yama of their souls. When the temple in Deshnok was built and consecrated to Karni Mata in the early twentieth century, it only stood to reason that there would be an open invitation to the rats of India to come and fill this place. And so, on a boiling afternoon in late July, some 700 years after her initial act of charity, I deposited my shoes among scores of others, and stood, barefooted, facing the yawning gates of Karni Mata. Among the multitudes of ordinary rats present at any given time at Karni Mata, there is also a handful of the white variety. They are supposed to be an incarnation of the goddess herself. Spotting one is the ultimate goal of every pilgrim who passes the gates. I steeled myself for what lie ahead and passed through the heavy silver doors into an open courtyard where the sun beat mercilessly upon the white marble floor. I was stunned at what I saw. There was not a single rat in sight. I wondered if I had entered the wrong place until, feeling foolish, I realized that I was standing in the least inviting spot possible for a nocturnal animal accustomed to lurking in cracks and shadows. The burning courtyard was ringed with covered porticos, small rooms, and interior shrines. As my eyes adjusted, I saw that in each of these areas, the floor was alive. I headed up the steps to a long, shaded porch on my right. The place was crawling with rats. They had huddled into the cooler recesses of the temple. They were writhing. They were rolling. They were waiting there for dusk. Filled with a sickly awe at the scenes playing out in front of me, I wandered from room to room. The rats tumbled from hidden vaults through gaps in the temple walls. They clamored in aggravated hordes, running over one another to lap milk from pans. There were great pestilential knots of them, piles and piles. Some stared in my direction, most were indifferent, many were dead. That was what surprised me most: the sheer volume of lifeless rats. Everywhere I stepped, I had to avoid crushing them with my bare feet. Many had collapsed onto their sides in puddles of water and milk and were kicking involuntarily, caught up in the throes of death, as their pitiless kinsmen trampled their dying frames. I made my queasy way throughout the compound, into one shadowy room after another, straining my eyes to spot an albino among the mounds of gray fur. There were lots of wandering pilgrims, women dressed in bright saris, a smattering of tourists, and of course, swarms of ordinary rats, but not a white one to be found. In one room, where a man was sitting on the floor beating a drum, a particularly large and intrepid rat darted over the tiles and across my naked toes. I wilted. Glimpsing my dismay, the kindly drummer paused and assured me that having one of the venerated animals run over my feet was very good luck, indeed. I smiled at him, but was too busy suppressing my gag reflex to respond. After an hour, I was ready to abandon my mission. I had entered every room, visited every shrine, and surveyed every tunnel at Karni Mata. Then, as I was preparing to depart, I noticed a small group of pilgrims buzzing in the far corner. They were pointing, excitedly. I hurried over to investigate. The people were crowded around a small fence, beyond which vast cauldrons of bubbling liquid were being prepared for distribution to the various pans and bowls. One devotee had sunk to his knees and, to gain special blessing, was lapping milk into his mouth from one of the pans. Next to the cooking furnace there was a large pile of wood. I followed the gazes and fingers of the animated worshippers and saw, deep within the stack, something moving. It was white, or at least, it seemed to be. With so much debris obscuring our sightlines, it was impossible to tell for certain if it was the lucky white rat, or conversely, a very unlucky one, a rat completely eaten up with mange. I had seen others like that around the temple. The pilgrims, however, needed no further evidence. They had seen their blessed white rat, Karni Mata herself, hiding in a pile of firewood, and were happy and content. If it was good enough for them, I thought, it was good enough for me. Good fortune is one of the things you take where you can find. I walked away smiling, feeling somewhat lucky myself. After all, I had not been bitten, and, as far as I knew, I had not contracted the plague. Chris Watts has written about Indian surfing, Burmese death rituals, conservation in the Palani Hills, and many other topics for EthnoTraveler.